Olivia dolls by Llorens are vinyl dolls, 37cm in height, made in Spain. They are child-like fashion dolls, with attractive clothing and hairstyles. Olivia dolls by Llorens are vinyl dolls, 37cm in height, made in Spain. We love that she has lots of articulation in her head, arms and legs for great expression. 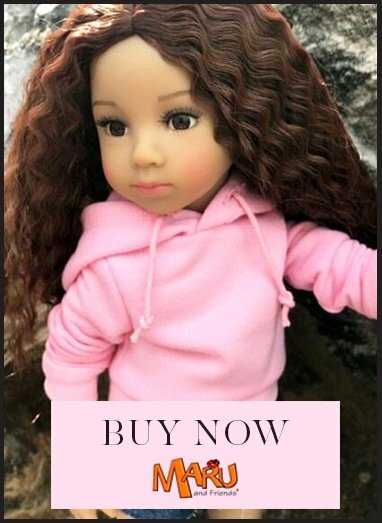 They are child-like fashion dolls, with attractive clothing and hairstyles. She has big brown eyes with a realistic patina which are framed by fibre eyelashes along the upper lid. She has feathered eyebrows, natural peachy blushing to the cheeks and glossy full natural lips. Her body is entirely vinyl. She is strung and holds poses well. Her hair is rooted and made of black nylon. She has shoulder length hair with a fringe. Olivia is packed in an attractive cardboard box making her ideal to give as a gift.